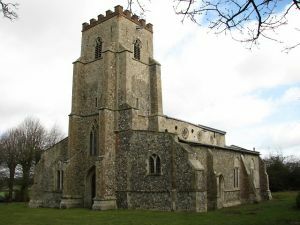 An attractive 14th-century church with a later Perpendicular tower and a two-storey porch, St Mary's is composed of a chancel and nave with substantial aisles on either side. The aisle buttresses join the tower high on its lower storey, giving the west end of the church a sense of enormous width, like a medieval barn. One of the more interesting features is the set of round quatrefoil windows in the clerestory over the nave. Rounded windows are unusual for this period, clerestories usually being supplied with arched windows, echoing those used throughout the lower part of the church. The interior features a monument in the chancel to John Greene and his wife, dated to 1684. Another interesting monument is that of Gibson Lucas, a fanciful rococo creation in marble, dated 1750. One medieval feature that has survived is a stone mensa, or altar slab, now used to top the altar table. The church is no longer used for regular worship and is in the care of the Churches Conservation Trust, who keep it open daily.